Product prices and availability are accurate as of 2019-04-21 19:35:00 UTC and are subject to change. Any price and availability information displayed on http://www.amazon.com/ at the time of purchase will apply to the purchase of this product. 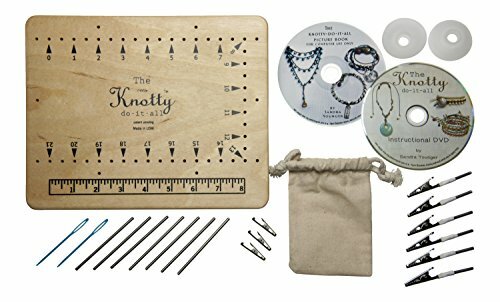 Sandra Younger's Knotty Do-It-All is a multi-functional cord knotting tool that allows users to quickly and easily perform a variety of knotting techniques, including coil knots, moose knots, overhand knots, macramé, braiding and much more. The sturdiest most versatile cord knotting tool on the market today includes an easy-to-follow instructional DVD showcasing a wide variety of bracelets and necklaces. With no experience you can make professional-looking jewelry in just minutes! Includes: 8 x 10" Board, 6 large clips, 7 stainless steel pins, 3 large eye needles, 2 thread keepers (bobbins), 1 cotton pouch, and two instructional DVDs.